“I’m not going to hurt you,” I said, my voice swam with honesty. “Right now? Or today? Or does that include tomorrow too?” she asked as her voice cracked and tears filled those broken eyes. I bit back my initial response, and instead echoed, “I’m not going to hurt you. But we need to get you out of this room.” I shifted forward, and watched every movement of her body as I rested my arms on my knees and clasped my hands together. Her chest hitched and her body jerked, but she didn’t move away from me. Her question slammed into me and made me lose my hold on that calm as everything I shouldn’t feel assaulted me again and again… The way those broken eyes made me want to beg her to forgive me. The way her screams made me want to tear out my heart. Only seconds had passed before she picked at the fruit she’d been eating, and after she’d taken a few bites, I slowly reached forward. She stilled as my hand neared the robe, just above her breasts, and her chest’s movements became exaggerated when I slipped my hand inside to slowly drag the material off one of her shoulders. A full minute came and went before she shakily resumed, and as before, I slowly reached forward after she’d finished taking a few bites. Her breath rushed out when I grasped the other side of her robe. “Please, d-d—” she said breathlessly, but didn’t continue. After another minute, she grabbed for the piece of toast. But even then, she just held onto it as she continued to violently tremble. I stood from the chair and walked to the edge of the bed. Pressing my knuckles to her chin, I waited until she was looking at me, then slowly dropped my hands to where she was grasping the satin material against her breasts. But I wasn’t sure that I could. Because my calm was crumbling, and I couldn’t hold onto that nothing that I so desperately needed to cling to in order to get through this. This girl and those eyes were devastating me in a way I’d never known—and couldn’t afford now. Nothing. Feel nothing, I maintained as I fought between covering her up, and continuing with what I knew we had to do. I forced that calm and that nothingness, and the tips of my thumbs brushed against her breasts as I bunched the material in my hands. Just as I was about to release the robe and let the material pool around her hips, a song fell from her lips, hushed and broken, and the sound made me pause. I looked back at her face to see it pinched with fear and her eyes squeezed shut, and again, I lost my weak hold on my calm. Only that time, I didn’t try to snap it back in place. I let everything she was making me feel consume me as I pulled her robe back over her shoulders, and stepped away. 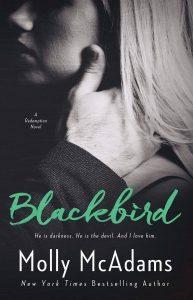 “Another day, Blackbird,” I mumbled, and let her voice follow me out of the room.